GRATITUDE JOURNAL: Pacquiao for Inspiration? While I was at the salon for 2 hours to have my hair colored, treated and cut, Jake was off by himself to do his own thing... explore ALA Gym next door. Out of curiosity, he went inside where he was gamely accommodated by the men who manned the gym. Though he's fond of sparring and pretend-fighting with his school friends, today was his foray inside a boxing ring wearing real boxing gloves. Here... He's got the form, don't you think? 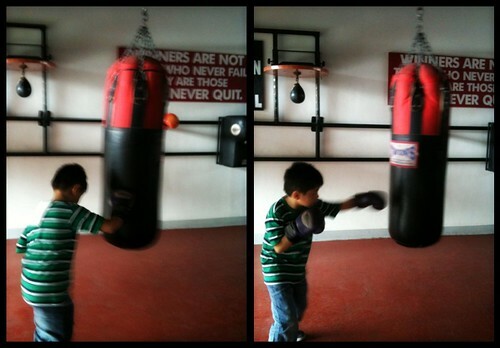 Another Pacquiao in the making? that's not a bad idea. :) it's just one of the things he wants to try at the moment.